Everybody wants to be the winner, but not everyone has the knowledge to come out on top. It doesn’t matter if you’re racing against your co-workers, friends, family, your own best time, or complete strangers – the goal is to be the first to cross the white line. You know what they say – if you’re not first, you’re last. 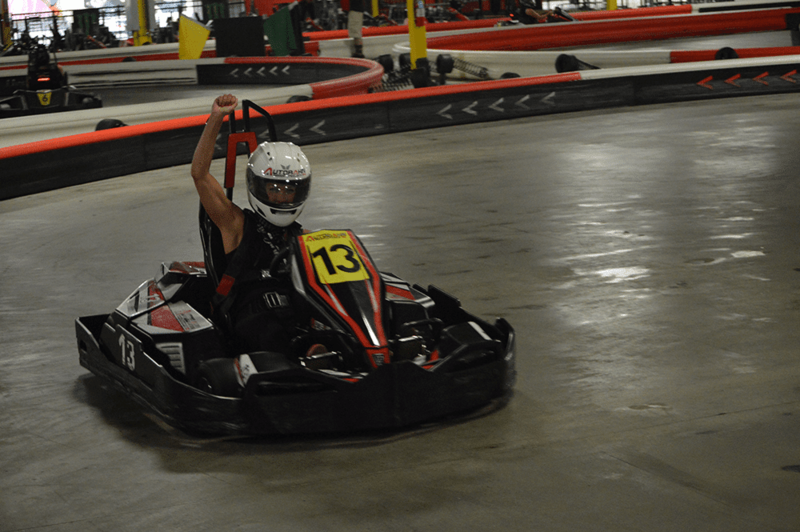 Next time you take a spin at Autobahn, pull out these go-kart racing tips that are sure to leave everyone in your dust. Get comfortable – The best way to set yourself up for success is to get comfortable in your kart. Adjust your seating so that you’re at a comfortable distance from the pedals and able to reach full throttle. The last thing you want is to start the race and then realize you’re too far away from the pedals. Sit correctly in the seat – If you want to take home the win, little details matter. Your posture can make a difference in the way your kart accelerates and moves. Be sure to sit with your back up against the seat, and try not to lean forward while you race. Believe it or not, leaning forward can actually slow you down. Have a symmetric grip on the wheel – Just like a regular road test, you should have a symmetrical or mirrored grip on the wheel. Whether it be at 10 and 2, or some other combination, a strong grip lets you have better control when turning and maneuvering the kart. A lazy grip will cost you time and speed by correcting your path. Anticipate your movements – Looking ahead while racing will allow you to anticipate what you need to do next. You’ll be able to avoid unnecessary braking and keep your momentum going. Find the racing line – A racing line is the fastest line or arc through a corner. By finding this line, you’ll be able to carry the most speed through the corner and onto the next straight-away. It takes some time to find the racing line, so your best bet is to practice and watch others as they take on turns. Where’s the best place to start turning and ensure you’re picking up the most speed? Don’t brake while turning – Braking is the smoothest while you’re going straight. If you bake while turning, your tires are more apt to spin out and lose traction. Instead, slow down a bit before the turn, so that you’re able to quickly speed back up. This is all part of finding and maintaining momentum, which translates into winning. Turn only when necessary – The quickest way to get from point A to point B is a straight line. Swerving in and out between other racers will cause you to go slower. The longer you go straight, the better chance you have of reaching your top speeds. Pick your battles – We all want to blast past our opponents – especially when we see they’ve let their guard down, but it’s not always a great idea to try barreling past an opponent. Other times, you’ll get stuck behind a driver who is just a little bit slower than you. You might be able to drive up to them, but it won’t be easy to pass them. Wait for the right moment, usually after a turn, to speed ahead of them. Get to know the track – The more familiar you are with the track, the more prepared you’ll be. Keep trying and learn to anticipate every turn. Soon it’ll become all muscle memory and you’ll be able to focus on other aspects of your race besides the track. Relax – The most important tip is to relax and have fun. Your best chance at winning is to enjoy yourself! If you’re too focused on winning, you’ll stress yourself out, and probably make poor decisions during the race. Staying relaxed and confident will let you have a better grip on the wheel and better control over the kart. Remember, practice makes perfect! These tips may take some time to master. Always feel free to ask an Autobahn employee if you have any questions or concerns. Even if you don’t win your first race, you’ll have plenty of opportunities to be victorious in other races. We’ll even keep track of your best times so you can see how you’re improving! Ready to head over to the track to test your skills? Find a location near you!